A review of UK and international practice. Read our updated briefing on learning analytics and student success from January 2017 (pdf). Learning analytics refers to the measurement, collection, analysis and reporting of data about the progress of learners and the contexts in which learning takes place. Using the increased availability of big datasets around learner activity and digital footprints left by student activity in learning environments, learning analytics take us further than data currently available can. 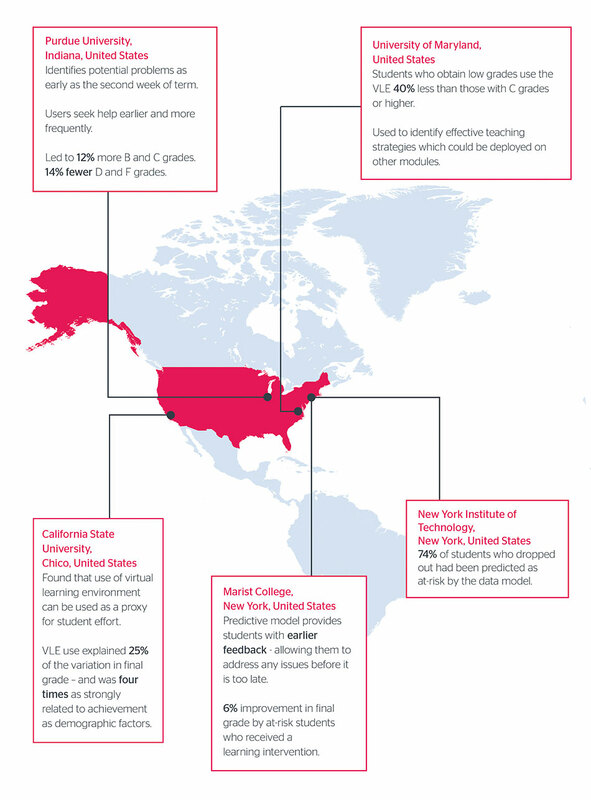 This report documents the emerging uses of learning analytics in the United States, Australia and the United Kingdom. Through a series of eleven case studies it presents an overview of the evidence currently available of the impact that analytics are having on teaching and learning – and highlights some of the opportunities for the UK higher education sector. Given the current focus on teaching excellence in the higher education sector, it will be of interest to policy makers and institutional leaders alike. A survey of vice-chancellors published last year by PA Consulting suggests vice-chancellors perceive the UK to be lagging behind, with 60% believing that the important innovations in student data analytics are taking place primarily overseas. and recommended that all institutions consider introducing an appropriate learning analytics system. Jisc is currently working with 50 universities in the UK to set up a national learning analytics service for higher and further education. This is the first time learning analytics has been deployed at a national level anywhere in the world, creating a unique opportunity for the UK to lead the world in the development of learning analytics. Although, learning analytics is still at a relatively early stage of development there is convincing evidence from early adopters that learning analytics will help to improve outcomes. With many teaching staff using data to improve their own practice, and many institutions proactively using learning analytics as a diagnostic tool on both an individual level (eg identifying issues) and a systematic level (eg informing the design of modules and degree programmes). In our response to the Higher Education Green Paper, we outlined how learning analytics could contribute to the Teaching Excellence Framework. In the first instance we expect that learning analytics data could be used by institutions as part of their submission of evidence to support applications for the higher levels of TEF. In the medium term, we will explore with the sector whether learning analytics data might be used to create appropriate new metrics. Similarly, we envisage learning analytics data will also be useful for institutions in demonstrating compliance with the new quality assurance arrangements being developed in England, which will require more regular review of outcomes and evidence of action taken by institutions to deal with issues. With institutions using analytics to identify at risk students – and intervening with advice and support – at an earlier stage than would otherwise be possible. With analytics being used to closely monitor the engagement and progress of sub-groups of students, such as BME students or students from low participation areas, relative to the whole student body, prior to assessment results being made available. Additional support can be provided to identified individuals from underperforming groups to improve attainment. At the University of Derby, analytics are already being used to ensure that decision making on supporting black and minority ethnic (BME) students is evidence-based. ie, personalised learning delivered at scale, whereby students are directed to learning materials on the basis of their previous interactions with, and understanding of, related content and tasks. 74% of students who dropped out had been predicted as at-risk by the data model. Created probability of retention scores for each undergraduate student - used to identify students most likely to need support. Learning analytics is part of a wider ecosystem of engagement with students via social media to foster a sense of community amongst students who may be studying part time, or at a distance, as well as on campus. SNAPP visualises participant relationships in online discussion forums in real time, as a network diagram. It helps facilitators to avoid dominating the conversation and encourage greater engagement with students who are less connected with their peers in the forum. The value of dashboards for enhancing teaching or future course provision is also highlighted by the studies. At the University of Wollongong, Australia, social network analysis revealed interaction patterns that arise in forums that are too facilitator-centric. At the University of Maryland, it was found that innovations which led to improvements in student performance on one course appeared to lead them to also perform better in subsequent courses. Meanwhile learning analytics can furnish teaching staff with better information on the quality of the educational content and activities they are providing, and on their teaching and assessment processes, to enable its continual enhancement. Obtaining better data on the student experience potentially enables an institution to identify and address issues of concern to learners such as inadequate feedback. Universities are reporting that these interventions can help to build better relationships between students and staff. Analytics can be used by lecturers and tutors to monitor the performance of their students while the module is taking place; they can then adapt their teaching if, for example, they identify that students are struggling with a particular topic. Other analytics on student data takes place retrospectively, enabling future cohorts of students to benefit from enhancements to educational content and processes. The roll out of learning analytics may have broader institutional impacts on learning, teaching and student support. At the Open University the aim is develop an ‘analytics mindset’ across the institution and to base decision making increasingly on evidence. At Nottingham Trent too it is reported that the project has helped to extend a culture of data-driven decision making across the university. Implementing learning analytics is often one strand of a wider institutional strategy, although even a small scale pilot can generate increased awareness and discussion around issues such as retention. In some implementations good practice has been identified at the individual tutor or module level that was previously invisible within the wider institution. Thus analytics can have beneficial effects beyond the immediate aims of the project, and can be part of a cultural change towards more evidence based decision making. Dashboards may have other benefits beyond the retention of students and the enhancement of teaching: at Nottingham Trent the dashboard is reported to have helped build better relations between learners and personal tutors. A better understanding of data about learners and their learning can help universities to tackle high attrition rates, which result in adverse impacts on the lives of those affected, and wasted expense for the institutions. By merging information known about individuals in advance, such as their prior qualifications, with data accumulated about their educational progress, learners likely to withdraw can be identified earlier than in the past. At Purdue University in the United States, for example, problems are identified as early as the second week in the semester, something which simply was not possible before. Student data analytics can be used to be predict which students will not progress to the next academic year. At New York Institute of Technology (NYIT), approximately three out of every four students who do not return to their studies the following year had been predicted as at risk by the model. Similarly, analysis of data from Nottingham Trent University showed that less than a quarter of students with a low average engagement score progressed from the first to the second year, whereas over 90% of students with good or high average engagement scores did so. Analytics have had a positive impact on retention Once an at-risk student has been identified, personalised interventions such as advice or support from a tutor can then be taken to help to try to retain those students. Some examples of interventions include student-facing dashboards which contain tools that show the student’s progress relative to their own goals or to the rest of the cohort. In some cases, this is found to motivate students, although other examples indicate, perhaps unsurprisingly, that the more confident and successful students tend to use the tools to a greater extent than struggling students. At the University of New England for example attrition was cut from 18% to 12% during early trials of their Automated Wellness Engine. The Signals project at Purdue University is one of the earliest and most frequently cited learning analytics implementations. Later projects have refined the modelling techniques, developed intervention strategies or transferred predictive models to other contexts. Use of the Signals system led to at 14% reduction in the number of D and F grades. Giving students better information on how they are progressing and what they need to do to meet their educational goals is another important application for learning analytics. Meanwhile some universities are providing analytics- based systems to help students to select future modules, building on data about their career choices, aptitudes and grades for previous modules to provide optimum pathways through their studies. 74% said their motivation was increased by using it. At Nottingham Trent some learners report that seeing their own engagement is a positive spur to stay engaged. Indeed, NTU have reported that the provision of learning analytics is now expected by students. Learning analytics has the potential to transform the way we measure impact and outcomes in learning environments – enabling providers to develop new ways of achieving excellence in teaching and learning, and providing students with new information to make the best choices about their education. The UK should grasp this opportunity to lead the world in the development and use of learning analytics. Learning analytics is still at a relatively early stage of development, but the processes for developing its use, and ensuring the authenticity and validity of the findings, are developing rapidly. Although not yet well understood yet across the sector, there is convincing evidence that learning analytics will help to develop more student-focused provision of higher education, and provide data and tools that institutions will be able to use for continuous improvement. We believe that continued investment in learning analytics by the UK higher education sector will lead to better outcomes for students, universities and wider society. Across business, industry, government and other areas of human endeavour, vast amounts of data are being accumulated and processed to develop understanding of people’s activities, and to optimise organisational processes and outputs. The use of data mining and business intelligence software to analyse their customers and products is now key to the survival and expansion of organisations across many sectors. In higher education large datasets exist about learners, their learning and the environments in which they study. Universities are however only beginning to understand how to exploit this to enhance the educational experience for their students. While there are some promising examples in the UK, this country is slipping behind the US and Australia in particular, where the new discipline of learning analytics is gaining increasing prominence among educators and policy makers. A number of drivers make it imperative for universities to obtain value from the rich data sources they are building up about their learners. Much of the impetus for learning analytics worldwide comes from increasingly stretched university budgets and a need for evidence based prioritisation of spending. While student fee income has to some extent alleviated financial pressures in English higher education, strong incentives remain to deploy resources spent on learning and teaching as efficiently and effectively as possible. Meanwhile students, as consumers, will increasingly, and justifiably, expect to be able to see evidence that their fees are being spent appropriately. Many universities have unacceptably high attrition rates, resulting in adverse impacts on the lives of those affected, and wasted expense for the institutions. There is a resulting drain on the economy, not least by increasing the number of student loans which may never be paid back. By merging information known about individuals in advance, such as their prior qualifications, with data accumulated about their educational progress, learners likely to withdraw can be identified earlier than in the past. Personalised interventions such as advice from a tutor can then be taken to help to try to retain those students. Better retention helps in numerous ways, not least in reducing the necessary expenditure on marketing and recruitment, and improving individual universities’ positions in league tables (Arnold, 2010). While not all institutions have problems with retention, educators are likely to have an interest in maximising the academic performance of their students and enhancing the overall experience of attending their institutions. This of course is likely ultimately to impact on league table positions and reputation, and thus improve recruitment. Learning analytics can furnish teachers with information on the quality of the educational content and activities they are providing, and on their teaching and assessment processes. Some analytics are used by lecturers to monitor the performance of their students while the module is taking place; they can then adapt their teaching if for example they identify that students are struggling with a particular topic. Other analytics on student data takes place subsequently, enabling future cohorts of students to benefit from enhancements to educational content and processes. Learners themselves, particularly when beginning higher education, often have little idea of how they are performing in comparison with others, have gaps in prerequisite knowledge, and lack key study skills. Giving students better information on how they are progressing and what they need to do to meet their educational goals is an important application for learning analytics. This has the potential to transform their learning and their understanding of how they learn by giving continual formative feedback as they progress through their studies. It also enables them to compare themselves to peers, adding a competitive element (an important motivator for many students) and a check that they are keeping up with the group or with the progress of successful students in previous cohorts. Meanwhile some universities provide analytics based systems to help students select future modules, building on data about their career choices, aptitudes and grades for previous modules to provide optimum pathways through their studies. Adaptive learning systems are emerging to help students develop skills and knowledge in a more personalised and self-paced way. These too may depend on data about a student’s aptitude and performance, together with fine grained details of their clickstream, enabling the educational content to be tailored to their level of understanding as they progress through it. While these systems may be inappropriate for certain aspects of higher education, particularly the development of higher order research and communication skills, they are set to revolutionise the teaching of basic skills and the provision of educational content. This data can also provide better understanding for educators of how their content is being used and how effective it is, and enable its continual enhancement. The student activity data can in turn be aggregated and combined with other educational data to give a richer picture of the effectiveness of learning programmes at successively higher levels in institutions, to programme managers, deans, senior management and ultimately education authorities and government. A number of institutions in the UK are deploying learning analytics in different ways and for a variety of reasons. A study was commissioned by Jisc in late 2014 which analysed the innovations in learning analytics in the UK (Sclater, 2014). The research found that early adopters were driven by a desire to enhance the student learning experience for reasons such as improving achievement and reducing the number of resits, providing better feedback, and empowering students to become more reflective learners. Some institutions had significant issues with retention and saw learning analytics as a way to identify students at risk of dropout; for others retention was not a significant problem. Providing students themselves with better information on their progress was also mentioned as being an important driver. An issue several institutions raised was the requirement to provide information on the attendance of foreign students to UK Visas and Immigration. This required capturing attendance data in various ways, which can be an effective proxy for student engagement and hence bring the additional benefit of being able to identify students, both foreign and local, who are struggling. Another clear external driver mentioned by some institutions was the National Student Survey; obtaining better data on the student experience potentially enables an institution to identify and address issues of concern to learners such as the provision of feedback. Manchester Metropolitan University attributed a nine per cent increase in student satisfaction over two years to its efforts to reorganise its curriculum based on better analysis of student requirements. Learning analytics is seen by some universities as a way of enhancing teaching, in particular by encouraging more timely marking of student work, and helping to build better relationships between students and staff. For several institutions the focus was on putting the analytics tools in the hands of staff who work directly with learners, and providing them with actionable insights into student performance. At Nottingham Trent University it was found that tutors were putting effort into supporting students who requested help but missing those who most needed it. A key aim of learning analytics there was to help identify students at risk before it was too late to intervene. A number of institutions mention varying levels of achievement among different ethnic groups or genders and describe how they are using analytics to identify and attempt to provide additional support to individuals from underperforming groups. The University of Derby used analytics to ensure that its decision making on supporting black and minority ethnic (BME) students was evidence- based. It developed a handbook of good practice for academic staff which appeared to have improved the performance of BME students. Nottingham Trent aimed to develop more fine-grained understanding of the factors which lead to a particular minority struggling. A group may have more difficulties with one subject than another, and individuals within a group do not necessarily conform to its characteristics, so the aim was to develop a highly personalised approach to the provision of student support. As well as a few high profile institution level deployments there are various examples of small scale initiatives in UK higher education to analyse data on students and their learning activities. These often fail to scale up, however interest among senior management in the potential of learning analytics to address strategic issues appears to be growing rapidly. A recent study by the UK Heads of Elearning Forum (HeLF) of 53 institutions found that the main focus of interest around learning analytics in UK universities is on retention and the enhancement of learning, with equal importance being placed on both. The same study found that nearly half of the institutions surveyed have not implemented learning analytics at all, roughly a third are working towards implementation and a fifth have partially implemented it. The report also mentions that three quarters of senior management had limited understanding of the benefits of learning analytics and that awareness and understanding vary widely across departments within institutions (Newland et all, 2015). Learning analytics is the measurement, collection, analysis and reporting of data about learners and their contexts, for purposes of understanding and optimising learning and the environments in which it occurs. There are overlaps across the three rapidly developing fields but educational data mining, learning analytics and academic analytics are increasingly diverging. Educational data mining is focused primarily on the technical challenges of extracting value from learning-related big data. Learning analytics is concerned with enhancing aspects of learning, while academic analytics focuses more on utilising data for marketing and administrative purposes (Ferguson, 2012; Long & Siemens, 2011). The field of learning analytics is influenced by a wide range of disciplines including education, psychology, philosophy, sociology, linguistics, learning sciences, statistics, intelligence and computer machine learning/artificial science. The two most dominant disciplines (by far) of the key researchers in the field are computer science and education (Dawson et al, 2014). Can analytics predict academic success? The idea that measurement of student participation through VLE accesses, submission of assessments and other data can be used as a proxy for learning and hence likely academic success is one of the key concepts of predictive learning analytics. Many studies confirm the assumption that those students who participate more are likely to perform better. A model produced at St Louis University in Missouri, for example, showed that student access to learning content and the gradebook correlated with their final grade. However, this was considered an unsurprising finding which did not provide any useful insights which could be used to support learners (Buerck & Mudigonda, 2014). Some reports have even suggested that the highest levels of participation do not correlate with the best results; sometimes the most engaged students appear to be the weaker ones who are working particularly hard to try to improve their performance (eg see the Nottingham Trent case study). A report by SoLAR, funded by the Australian Government’s Office for Learning and Teaching (Siemens, Dawson & Lynch, 2013), contains ten brief case studies from some of the most prominent learning analytics initiatives in Australia, the US and the UK. It is notable that few of the projects yet claim any significant impact from learning analytics – and many seem still to be at early stages of implementation. One exception is Queensland University of Technology’s early intervention programme which the report states “has resulted in significant improvements in retention for those students who have been successfully contacted”. However, no data is provided to back up this claim. One of the case studies in the SoLAR report however has some concrete data and significant outcomes: at the University of South Australia 730 students across a range of courses were identified as at risk. Of the 549 who were contacted, 66% passed with an average Grade Point Average (GPA) of 4.29. 52% of at risk students who were not contacted passed with an average GPA of 3.14. This appears to be a significant finding, implying that intervention strategies with struggling students could be extremely important for institutions: if you are identified as at risk but left alone you are not only considerably more likely to fail but your result is likely to be much worse too. The dearth of such data overall in the literature and rigorous, empirical, replicable studies however makes it difficult yet to justify any grand claims for the impact of learning analytics. The case studies provided in this report highlight the work of some of the leading institutions which have provided evidence of effectiveness. Papamitsiou & Economides (2014) attempt systematically to analyse the empirical evidence for learning analytics and data mining by examining the literature on case studies between 2008 and 2013. They identified 209 relevant papers in international journals and conferences but narrowed these down to forty based on the number of citations, the degree of innovation, the quality of the methodology and adequate presentation of the findings. From this they created an analysis of the strengths, weaknesses, opportunities and threats identified in the literature. As educational activity moves online, and content accessed by students is increasingly digital in format, the data sources available to analyse learning are expanding. Much of this is ‘big data’, datasets which are regarded as being too large for standard database systems to handle (Manyika et al., 2011). The main source being used for learning analytics is the virtual learning environment (VLE), where students increasingly have to go to view timetables, assessments and course information, access learning materials, interact with others through forums, and submit assignments. The use of the VLE varies considerably across modules, courses and institutions. Where it is used as the primary means of course delivery in for example distance learning programmes or MOOCs it is likely to provide a rich source of data. Learning analytics can still however provide useful insight on student engagement in courses which do not use a VLE. The second major data source is the student information system (SIS), which contains data about students such as their prior qualifications, socio-economic status, ethnic group, module selections and grades obtained to date. This is all potentially valuable information to bring together with VLE activity data in order to predict academic performance. Data from the VLE and SIS is frequently supplemented by other information. In some institutions attendance monitoring systems are in place which record campus visits by students or their presence in particular locations such as lecture halls, libraries and refectories. This can be captured from swipe cards, proximity cards and other entry systems, or from accesses to institutional wifi services by students. Library data too can be added to the mix. Information such as a students’ library visits, records of book borrowing and access to electronic journals is provided to personal tutors in some institutions on dashboards for facilitating conversations with individuals or groups. For example analytics of historical data for a module may show that success is associated with frequent access to library resources. If analytics on the current cohort show that fewer students than expected have so far visited the library, an instructor can bring this to the group’s attention, with the intention of modifying the students’ behaviour. They can back up their suggestions with evidence from previous students. In the UK the main data sources being used or planned for use by institutions are the VLE, SIS, and library systems. The SIS may include much useful information such as details of a student’s financial situation, the number of hours they spend working, and their prior academic attainment. End of module surveys and other questionnaires completed by students can provide a rich source of data for learning analytics too. Learners not only consume content provided by their institutions but also create increasing amounts of data themselves, again potentially valuable in assessing their engagement and progress. As well as assignments and examination responses, students may write blogs, develop e-portfolios and create video or audio content or software, all of which can be processed automatically. End-of-module questionnaires and other survey data can also be valuable sources of data for learning analytics. Jisc is developing a student app for learning analytics, influenced by some of the increasingly popular fitness monitoring software applications such as Google Fit. This enables students to set targets for their study activities, record them and compare their progress and results with others. Use of the app itself provides yet more data which can be used to refine algorithms for predictions of student success. One issue for institutions wishing to invest in learning analytics is the nascent state of the relevant technologies and the lack of consolidation in the marketplace. A battle for commercial dominance is taking place between vendors of VLEs (eg Blackboard), SISs (eg Tribal), business intelligence and visualisation software (eg IBM Cognos, Tableau, Qlikview) and emerging bespoke learning analytics packages (eg Civitas Learning). The HeLF survey (Newlands et al, 2015) found that institutions were considering a great variety of different solutions, including their own in-house developments. This echoes Jisc’s findings of very little common ground in the systems being deployed for learning analytics across the thirteen leading institutions it interviewed (Sclater, 2014). One of the main requests coming from the higher education community in the UK was for a basic learning analytics solution which institutions could use to start to experiment with learning analytics. The resulting architecture is shown below. 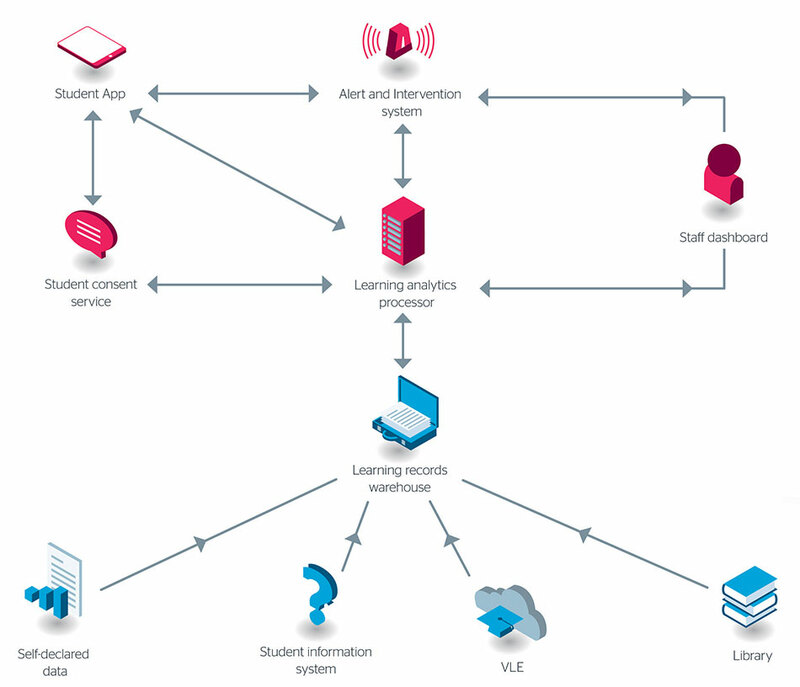 This shows how data from sources such as the VLE, the SIS, library systems and students’ own ‘self-declared’ data feed into the learning analytics warehouse. At the heart of the architecture is the learning analytics processor where predictive analytics are carried out, and lead to action coordinated by the alert and intervention system. Visualisations of the analytics for staff are available in a series of dashboards, and a student app allows learners to view their own data and compare it with others. The student app provides students with data on how their engagement and attainment compare with those of other students, enabling them to plan and set targets for their learning and to receive positive reinforcement through the app when they meet these targets. Meanwhile a student consent service helps to ensure privacy by enabling students to give their permissions for data capture and use. This software is being provided freely to institutions for the first two years as a combination of commercial and open source systems, hosted as an open, multi-tenanted, cloud-based solution. This allows institutions to share the same highly scalable architecture but maintain complete control over their own data. They can also select individual components if they do not wish to deploy the whole solution. The predictive models can be made available for inspection openly and transparently, facilitating greater trust by end users than closed commercial models. There may also be opportunities for a trusted broker to validate proprietary metrics and algorithms on behalf of the sector. Expertise can be shared across institutions in many ways eg the identification of appropriate metrics, the development of predictive models, and the deployment of the systems themselves. At the moment innovations are happening on a small scale, often at departmental level, and experience is not being shared adequately, resulting in duplication and a waste of resource. The Jisc initiative is being watched with interest in other countries, particularly in North America, Australasia and a few European countries, notably the Netherlands and France. No other country has yet put in place a national infrastructure for learning analytics, however the Predictive Analytics Reporting (PAR) framework in the US has been set up to share data, analyses and findings across institutions. One of its main achievements has been the creation of a set of common data definitions, defining common variables across US higher education institutions. It has now built up a database of two million de-identified student records, which it claims can identify at-risk students with 90 per cent confidence (PAR, 2015). Most of the large scale, systematic implementations of learning analytics to date are in the USA. Various universities in Australia and Canada are also rapidly gaining experience in analysing data about students and their learning at an institutional level, particularly with the aim of enhancing retention. Documented case studies in other countries elsewhere in the world, other than in the UK, are scarce. Reflecting the current emphasis in the field on identifying students at risk of attrition, and hence enhancing retention, most of the case studies concentrate on predictive analytics. Learning analytics is not however solely concerned with reducing attrition rates, and here the Australians are engaged in some of the most interesting innovations. One of the studies relates to the use of social network analysis to enhance learning and teaching at Wollongong. Another examines how analytics can be used to help students plan pathways through their modules at Open Universities Australia (OUA). What impact has student data analytics had? The early identification of at-risk students is an aim common to most of these initiatives. At Purdue problems are identified as early as the second week in the semester, something which simply was not possible before Signals. However, interventions with students deemed to be at risk may have unintended consequences. At Marist it is accepted that the analytics might have encouraged some to withdraw from courses who would not ultimately have failed. Analysing the data may help to discover factors relating to student success which can then be revealed to future cohorts to encourage them to change their behaviour. For example students who obtain D or F grades at UMBC use the VLE around 40% less than those with C grades or higher, a finding which remains constant, year after year. The caveat here is that the more confident or successful students may tend to use the VLE more than struggling students, so correlation between VLE usage and grades has to be interpreted with caution. CSU found that analysing the type of activity within the VLE gave more useful results than bulk data about VLE use in general. However providing students with the profile of a successful learner may help to encourage the right behaviours. VLE tool at UMBC. Here too, interestingly, it was found that innovations which led to improvements in student performance on one course appeared to lead them to perform better in subsequent courses as well. Dashboards may have other benefits beyond the retention of students and the enhancement of teaching: at NTU the dashboard is reported to have helped build better relations between learners and personal tutors, and its provision is now expected by students. At UNE too, learning analytics is part of a wider ecosystem of engagement with students via social media to foster a sense of community amongst those who may be studying part time or at a distance as well as on campus. Qualitative feedback from students also shows that sharing their experiences of study increases their motivation. This is highlighted at NTU, where analytics is giving the university insight into ways to improve processes in many aspects of institutional business. At NTU too it is reported that the project has helped to extend a culture of data-driven decision making across the University. At the OU the aim is develop an ‘analytics mindset’ across the institution and to base decision making increasingly on evidence. It is important to note that many of the implementations described in these case studies are at a relatively early stage. Processes for reviewing the use of learning analytics, modifying the way it is used institutionally and ensuring the authenticity and validity of the findings, are not well-represented here. Also, there may be wider implications for each institution, as staff learn how to use evidence in their day to day activities and reveal opportunities and challenges which were previously hidden. Predictive learning analytics models – are they accurate? At this early stage in the development of learning analytics, the creation and refinement of predictive models is one of the main activities being undertaken by institutions. Some implementations are explicitly based upon educational principles or an ethos consistent with the institution’s aims eg programmes at OU and the UNE. Others appear to be based upon a normative or deficit model, identifying behaviours that do not match the cohort or expectations of the course. Predictive models use a range of mathematical approaches to analyse factors that were chosen as likely indicators of students at risk of attrition (NYIT, CSU). These factors were identified from staff experience, from published literature about retention, and by training models based upon data available within the institution. Bringing in the knowledge at an early stage of specialist staff who will be taking interventions can be essential: at NYIT the expertise of counselling staff who support students was deployed to help define the model for identifying at-risk students. While the student is learning, the VLE can generate large volumes of detailed data; the challenge then is to identify which measures are useful and link them to student behaviours and success. Other data, such as library access, attendance at class and submission of assignments is helpful in giving a more rounded picture. Simple measures such as a drop off in a student’s use of the VLE, or a change in mood evidenced by their choice of emoticons on the student dashboard, as shown at UNE, may be sufficient to indicate where support is needed. At NYIT data on previous students was used to train the model using four different mathematical approaches. Extensive work was carried out at ECU to identify which student variables predicted attrition using their own institutional data, a decision based upon an extensive review of the literature and other models. NTU calculates engagement scores from VLE access, library usage, door access card swipes and assignment submissions. A number of the institutions describe how they plan to extend and develop their models by adding more data in subsequent versions. Many predictive systems use demographic and pre- enrolment data in their models. When designing a model to identify new students at risk, the lack of data about each student’s behaviour is a problem that may be addressed by modelling across cohorts. Other data sources can be gathered from direct contact with the student, such as student surveys or data about the student’s financial situation or emotional state. A major challenge is the analysis of fragmentary data from multiple sources. Each item of information may have contextual idiosyncrasies and interact with other information in multiple ways (eg Personalised Adaptive Study Success - PASS at OUA). Meanwhile some models incorporate semantic or other qualitative data to enhance the validity of the model. The review identifies some of the most common and most important metrics to predict student success. Whitmer also finds that predictions of student success are more accurate when using multiple demographic variables than single ones. He suggests too that predictive analytics is better performed on categories of usage (eg engagement or assessment) than at the level of individual VLE tools. His analysis of CSU students finds that total hits is the strongest predictor of student success, with assessment hits coming a close second, again appearing to confirm the finding from other studies that what you do as a student is a more important predictor of your future academic success than who you are or what you did in the past. So how valid are the models? Do they successfully predict attrition and academic achievement? Many implementations test the models thoroughly against historical data from the institution. Much of the work in developing the models concerns the weighting of risk factors and adjustment of parameters to optimise the match with student behaviour. Generally, the greater the range of data sources and the more options tested, the more valid the resulting models, though research at CSU and Marist shows that some data sources make minimal impact on the predictions. At NYIT recall of the model is 74%; in other words, approximately three out of every four students who do not return to their studies the following year had been predicted as at-risk by the model. This high recall factor is reported to be due to the choice of model, careful testing of alternatives and the inclusion of a wider range of data than other similar models: financial and student survey data were included in the model as well as pre-enrolment data. Although many institutions developed their own specific models rather than adopting those developed elsewhere, a key finding of the Open Academic Analytics Initiative led by Marist College is that the predictive models developed at one institution can be transferred to very different institutions while retaining most of their predictive abilities. Open analytics is a movement within the analytics community which may offer an effective approach in future. In contrast to predictive analytics, other systems aim to increase the effectiveness of student engagement in real-time. For example, Social Networks Adapting Pedagogical Practice - SNAPP at Wollongong - focuses upon the quality of discussion in online forums, as these are a common feature of courses. The underlying principle is that greater engagement in discussion leads to enhanced student success. Social network analysis is used to visualise interactions between participants in forums, showing patterns typical of an active peer to peer discussion or less desirable patterns of isolation or dominant individuals. This can inform learning design and the staff development of forum facilitators. Personalisation of learning, and guiding the student along a learning pathway that meets their specific needs, are other uses for learning analytics. Here, the data is used to generate recommendations for learning activities, to indicate progress towards learning outcomes and to route the student into alternative modules, depending upon their current situation. PASS at OUA aims to personalise the study experience for each student, especially the path through the curriculum. A combination of statistical and qualitative data is drawn from the student profile, learning profile and curriculum profile, as well as data from discussion forums and responses to open-ended questions. How have analytics been used? Some of the institutions profiled are still at the stage of reporting on the development of metrics and the rolling out of their initiatives. However it is only when actions are taken with students on the basis of the data that the true value of learning analytics can become clear, so those studies which report on interventions and their effectiveness are of particular interest. In the cases using predictive analytics, the output is commonly a dashboard or alert system for staff with responsibility for supporting students. Many of these work in real-time on a daily or weekly cycle to identify students at risk of attrition, so staff can make proactive interventions to support those students. Interventions are usually initiated by an email or text message from staff to student, although some systems enable staff to put indicators onto the student’s home page. Generally, proactive support from staff is more effective than waiting for students to ask for help. There are, however, some issues reported, such as students who appeared to be ‘immune’ to intervention and others who feel that interventions are demotivating or confusing, especially when communicated multiple times across a range of media (Purdue). At the OU, a range of dashboards, tools and on-demand reports is being developed for students and staff at all levels within the University, working over timescales from days to months or years, in terms of organisational and curriculum change. At OUA customisable dashboards are provided for students, facilitators and instructional designers. Some of the dashboards reported on in these studies show a surprising amount of detail: at NYIT support staff can see whether each student is predicted to return to their studies the following year, the percentage confidence in that prediction from the model and the reasons for the prediction – this then provides a basis for discussion with the student. However, complex data visualisations, dashboards and other support for learners may not be necessary. Marist’s experience of directing at-risk students to a sophisticated support environment suggests that simply making them aware that they are at risk may suffice. Apparently confirming that a simple notification may be all that is required, at Purdue it has been found that students who use Signals seek help earlier and more frequently. There also appears to be an impact on grades for those students who are able to view data on their engagement and progress. At UMBC students who used a tool to compare their VLE activity with that of other students were 1.92 times more likely to be awarded grade C or higher compared with students who did not use it. Another reported positive impact on grades was at Marist where on one course there was a significant improvement in final grade (6%) with those at-risk students who were subject to an intervention compared with the control group who were not. Some improvements to retention as a result of interventions are also documented in the case studies. At UNE for example attrition was cut from 18% to 12% during early trials of the Automated Wellness Engine. Involving the support staff in the problem definition for the implementation is helpful in ensuring that the technical and organisational systems are developed in parallel. At CSU, the support staff team was reorganised to establish new roles and working practices alongside the new dashboard designed to support that work. The impact upon support staff of increased workload due to an alerting system needs to be considered, especially at busy times such as induction. The expertise of student-facing staff is important to ensure that interventions are appropriate and genuinely helpful to the student. At the OU, student support staff use learning analytics to inform proactive interventions across the cohort, based upon agreed criteria, in addition to reactive support and other existing initiatives. At Purdue, students are given feedback through traffic lights, however human mediation is considered important as well, though: messages are tailored by the instructors. This is important too at NTU, where tutors are prompted to contact students when their engagement drops off. Some examples include student-facing dashboards which contain tools that show the student’s progress relative to their own goals or to the rest of the cohort. In some cases, this is found to motivate students, although other examples indicate that the more confident and successful students tend to use the tools to a greater extent than struggling students. In one case study, the increased student performance due to the use of analytics on one course appears to impact upon the same student’s performance on subsequent courses. Learners overall seem to like having better data provided to them on their progress. 89% of students in one survey at Purdue considered Signals a positive experience, while 74% said their motivation was increased by using it. At NTU some learners report that seeing their own engagement is a positive spur to stay engaged. Objections by students to the use of their data for learning analytics are not widely reported in the case studies or in other literature. In many cases, the organisational culture is an important factor in the acceptance and uptake of learning analytics. Ethical and privacy issues are addressed in a variety of ways, depending upon the institutional context. In particular, it is reported to be helpful to involve students and staff in the approval and adoption of open and transparent codes of practice and policies for the use of learning analytics. These policies can be supported using existing institutional governance and consultation structures. A Policy for the Ethical Use of Student Data was agreed with students and staff at the OU through the usual governance and consultation channels. Openness and transparency are key principles, which take this policy beyond the legal requirements. At NTU, transparency and a close partnership approach with students are regarded as having been critical to the success of the initiative, and have addressed ethical concerns about the use of student data. Joel left Jisc in February 2018. Most recently, he worked with the chief executive and members of the Jisc executive group, providing strategic and operational advice and support. He also contributed to the development and implementation of the Jisc group strategy. Niall Sclater, consultant and Director of Sclater Digital Ltd, has more than 20 years of experience of innovation in online and distance education, specialising in e-learning, educational technology and distance learning. Current work includes research for Jisc in learning analytics.